(Rome) The terrorist militia Islamic State (IS) has released a new propaganda video. The video shows a suicide bomber shortly before his deed. In his message he appears certain that Islam will carry "victory" and the followers of Allah will soon pray in Rome instead of the Christians. The suicide bomber blew himself up shortly after recording his video message in Benghazi in Libya in the air. He turns in his message to the jihadists in Syria and Iraq, who he wants to "win" and to "pray in Rome". Abdel Rahman el-Libi is the name of the Islamic kamikaze. He refers in his message to the "prophet" Mohammed, who had already predicted the victory over Rome. The Islamists should not fret neither the unity of the "crusaders," nor the Arab tyrants who were against them, Allah will give them victory. "We are a united nation and sharia will prevail throughout the world." The video lasts 14 minutes and shows several pictures of suicide attacks in Libya and references inter alia to the Libyan General Khalifa Haftar, the commander of the army of the government of Tobruk. According to the press agency Alwasat, Abdel Rahman el-Libi was killed in a suicide bombing last July 30 against a center of the Libyan army in Kawarsha in Benghazi. His video has just now been released by the Islamic State (IS) on the Internet. (Rome) Shortly before the beginning of the Year of Mercy, Italian security agencies are working hard to close security gaps. 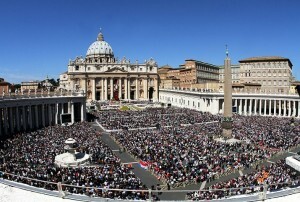 Current critics says it may be easy to smuggle weapons say Vatican security experts criticizing the current situation. A journalist recently made a test and easily smuggled a pistol at St. Peter's Square this past Saturday. The Prefect of Rome adopted a series of measures for the Jubilee of Mercy, which will be opened tomorrow. The transport of weapons, fuel and other flammable liquids has been limited. The prefect relies on anti-terror laws. In concrete terms, they should prevent assassinations by Islamic State be prevented (IS) and other jihadi militias. The threat of such attacks is classified as "realistic" by the Italian Ministry of the Interior. Prefect Franco Gabrielli has adopted for the period starting on Sunday, December 6th to Wednesday, December 9 a ban on any transportation of weapons, ammunition, explosives and toxic gases on the entire territory of the Rome Prefecture. Also prohibited is the setting off of fireworks of any kind. For the entirety of the 8th of December when the Catholic Church celebrates the Solemnity of the Immaculate Conception, any transport of fuels, LPG, methane and other flammable substances is prohibited. Citizens were advised to not to use during those days, cars, gun cases, envelopes or packages, which are commonly used by the army or the police, or could serve for the transport of weapons, to rule out any likelihood of confusion or suspicion. Prefect Gabrielli is one of the most experienced counterterrorism specialists in Italy. Since 1987, he has worked in senior positions of state security (DIGOS).From 2000, he headed the DIGOS of Rome. He was involved at the breaking up of the newest generation of left-wing extremist terrorist organizations the Red Brigades (BR). In 2004 he took over the construction of the newly established Counter-Terrorism Committee (CASA) and in 2005 was head of the Centre to Combat Terrorism at the Interior Ministry. During that time Islamic perpetrators of the London subway bombings were arrested in Italy. In 2006 Gabrielli became head of the Italian domestic intelligence SISDE. Last April he was appointed overlooking the Holy Year of Mercy as Prefect of Rome. According to media reports, he shows prefect optimism, but was worried actually about existing vulnerabilities. For this there is also no reason: Tomorrow, Pope Francis will be present at the opening of the Holy Door of St. Peter's Basilica, the Jubilee of Mercy. Only last Saturday the journalist Mary Tagliazucchi reported the daily newspaperIl Giornale about how she could easily reach St. Peter's with a pistol in her pocket in the late morning." 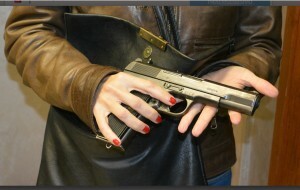 Smiling, Handbag and Gun: So I Came to the Vatican", is the title of the article. "A few days before the beginning of the year of jubilee I showed up with a pistol on St. Peter's Square without any problems. A (false) disability card sufficed ... This was "recognizable as a fake." The journalist smuggled a pistol, brand Tokarev TT, Model 57 Jugo, 7.62 mm into the Vatican. "This weapon is especially common in Eastern Europe, Africa and the Middle East. It was also used earlier in the year during the attack on the Jewish supermarket in Paris," as a weapons expert confirmed for the journalist. The reason for the destruction indicated by local sources were that crosses were over the buildings. People apparently were not harmed. Vatican City (kath.net/KNA) The terrorist militia of the "Islamic State" has tried to blow up a convent in Mosul in northern Iraq. The convent building of the Chaldean Sacred Heart Sisters and the church were severely damaged, reported the Vatican press Fides (Tuesday). The reason for the destruction indicated by local sources was that there were crosses over the buildings. People apparently were not harmed. According to sources, a first detonation was unsuccessful. The militias then increased the charges. The residents were warned in advance. The nuns had apparently left the complex. According to Fides, the fighters of the "Islamic State" used the monastery for some time as a headquarters and logistics base, but left apparently out of fear of US air strikes. According to the press service, the building had been built with a donation from the former Iraqi dictator Saddam Hussein. Whether an adjacent George's Abbey was also affected by the explosion is unclear. (C) 2014 CBA Catholic News Agency. All rights reserved. According to media reports, the authorities have charged the identified suspects in the Veneto region, inter alia, of the recruitment of fighters for the "holy war". The detainees are reportedly to non-Italians. Rome (kath.net/KNA) The Italian police have arrested five Muslims, who are closely related to the jihadist organizations in Syria and Iraq. According to local media reports on Wednesday that authorities have identified suspects in the Veneto region, inter alia, of the recruitment of fighters for the "holy war". The detainees are reportedly non-Italians. They are in the cross hairs of investigators in the course of the nation's increased security measures against militant Islamists. The Italian Interior Ministry fears that Islamist terrorists might deliberately mingle with the large numbers of boat people coming across the Mediterranean. On Tuesday, the Vatican had denied reports that Islamic terrorists could be planning an attack on Pope Francis. This unfounded, said Vatican spokesman Federico Lombardi, as kath.net reported. 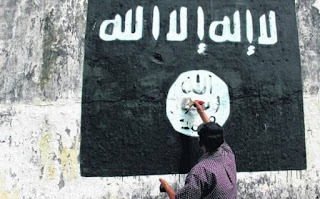 The Italian newspaper "Il Tempo" had reported that the terrorist militia fighters "Islamic State" could prepare an attack on the Pope. Citing Israeli sources, their leader, the self-styled "Caliph" Abu Bakr al-Baghdadi, stated that he had ordered attacks in Europe and in particular against Francis as "the greatest representatives of the Christian Religion" and "supporter of false truth". (C) 2014 CBA Catholic News Agency. All rights reserved. (Damascus) Last week was the parish of the Holy Trinity in Aleppo was the target of a brutal attack by Syrian rebels. The parish church was attacked with a rocket that struck just in front of the church. Three Christians were killed, including two nuns. Now the priests and faithful have planted an olive tree in response at the point of impact, as a sign of peace and for the future. "We had just celebrated the Holy Mass. Had the rocket hit the stairs to the church, the number of victims would have been much greater," said Father Joseph Bazouzou to the news agency Fides. Last Sunday, the priests and faithful of the parish gathered after the Sunday Mass, "to give the only answer to the bombs and the violence that for years always claims new lives," said the priest. 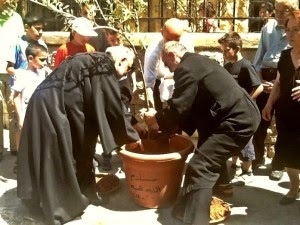 As a symbol against violence and for the hope in Christ, they planted an olive tree at the point at which the Islamist rocket struck and took three dead. They wrote in Arabic on the pot: "Peace" and "God is love". Since the outbreak of the civil war, Christians have been the target of Islamist rebels. 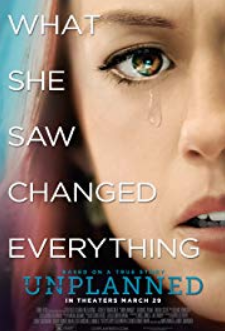 Christians are murdered, expelled, or forcibly converted subject to the Islamic dhimmi system. While the West is silent or finances the Islamists and equips them with weapons, church organizations engage in concrete help. Regarding the Prayer of the Fraternity of St. Peter for the persecuted Christians and the fasting and prayer of Cardinal Christoph Schönborn of Vienna has already been reported. Help for needy Christians, who made ​​up 15 percent of the population, according to the Church historian Rudolf Grulich, until the outbreak of the civil war in 2012, comes from the Relief Organization, Church in Need .